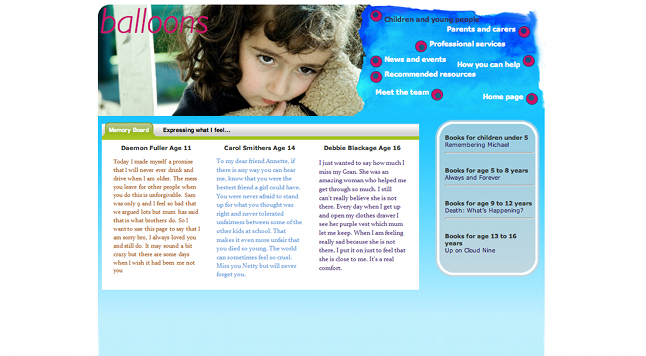 Bow Software : Balloons - Children's bereavement website with a powerful reading list. Balloons - Children's bereavement website with a powerful reading list. The recommended resources are content managed by the client, so new books can be added as they are released or titles removed if they are no longer required. We took the reading resources a step further by setting the client up a Amazon book store which mimicked the charities branding and feel of their website, and sits within the Balloons website. All the books in the recommended resources section are available to buy through the Balloons Amazon book store and each time a book is purchased in this way, the charity is paid 10% of the transaction fee.